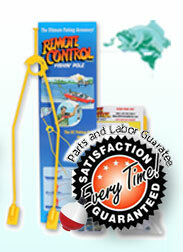 Fish Fun Co. Rc Fishing Boats All Include "The RC Fishing Pole", Bobber, Fishing Line and Hook Ready For Fishing! Our boats range in size, and come with everything, Batteries/Charger, Radio Controller and a Boat Stand, Extra Propellers, ready to catch fish! The best Remote Control Boats for RC Fishing are here. Catch Big Fish or Small Fish. Use the Line Release for Any size fish or for small fish just go fishing with the line attached on The Rc Fishing Pole and drive the fish in with the boat! 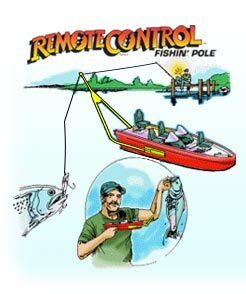 If you have your own Rc Boat, then Buy The Rc Fishing Pole and use your own R/C Boat for Fishing. Put the self-adhesive Rc Fishing Pole holders on the boat, The RC Fishing Pole snaps in and you're ready to Go R/C Fishing. You can also remove "The "RC Fishing Pole", it's easy to take off the boat so you can have fun with the RC Boat when you're done RC Fishing! Click on any Boat Picture to see the remote control boat full description and details, with pictures. I have seen tons of these but this one is awesome. I gave it to my father to play with at the cottage and he loves it. *It is pretty big (what man does not love toys that are big), especially for a remote control boat. *The range on this thing is great. *I can not believe how fast this thing goes Literally not one bad thing to say about it, got it over a year ago and still my Dad's favorite toy! Fits on Any Rc Boat! 7 Year Old Son Loves it! Fast Shipping! We bought this boat for our 7 year old and he loves it. We use it in a creek that doesn't have a strong current and the boat performed great. We didn't use the fishing pole yet, he just had fun driving the boat all over the place. Battery lasted for about 20 minutes of constant driving. This a great company to use too. We ordered it on a Sat. night and received it on Thurs., just in time for our vacation. THIS IS AN UPDATE> It's been two years since we bought the boat and it is still working great!! Worth every penny. Great Day Fishing with the Kids and Grandchildren! "I just wanted to tell you quickly, that I took my son, and grandson fishing on Belle Isle this week. And within 15 minutes caught my first fish, and it was all down hill from there. After I caught two green back rock bass, and one big mouth bass with the boat I won. Gets My Line Where I normally Could Not Cast it! Your product is great, for the last 8 years I have tried to fish in the cove, and could not get the line to the spot. But it was not a problem for the boat and the fantastic R/C Remote Control Fishing Pole. Thank you very much for this product, and I have told everybody I fish with the boat now!" W.M. "I caught a six pound bass with my rc fishing pole will send pic!." J.A. Great Way to Fish and Fits on Any Rc Boat! "I really like your fishing RC Pole. I bought a “SuperVee27” recently and I love it. It is a great way to fish and at the same time have fun on the water." A.S. Sends the Bait out and Catches a 40" Pike! "I find it good for sending bait out to where I want the bait to be." "Caught a 40" Pike with the boat!!!" Email us your R/C Fishin' Story Look who catching fish with Fish Fun RC Fishing Boats! Fill with Baited Hook, Chum, or Lure, and Release it anywhere! Email us your R/C Fishin' Story -"Look who catching fish with Fish Fun Co. Remote Fishing Boats For Fishing"!